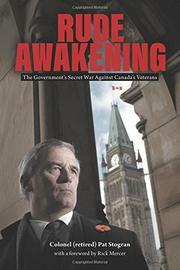 An uncompromising look at the way the Canadian government treats veterans of its various military branches. Stogran presents a sobering account in his nonfiction debut. After a 31-year career in the military, during which he was “threatened, shot at, shelled, held at knife-point and detained in a makeshift cell” in active-fire zones such as Bosnia and Afghanistan, Stogran took a position as Canada’s first Veterans Ombudsman, a position that he claims was more traumatizing than his years in the service. He effectively grounds what’s essentially a white paper on the state of veterans’ affairs by first giving readers a brief autobiography. He was born in La Sarre, Quebec, in 1958, met his future wife during his first regimental tour, and later juggled raising a family with the needs and postings of the service. Although he laces his account with an appealingly gruff, low-key sense of humor, he’s quite frank in recounting numerous occasions when he locked horns with his superior officers, almost always on issues affecting the welfare of the men under his command. Upon retirement, he belatedly learned of the creation of a new ombudsman position, which he viewed as “an opportunity to leave the CF gracefully and give back to the soldiers, sailors, and air force personnel I had served with.” What he finds after taking up his new responsibilities is shocking: “a stagnant, unresponsive, and dysfunctional system” that fails to meet the needs of veterans struggling with issues such as homelessness and post-traumatic stress disorder. Stogran’s account of how he confronted this system is blunt and free of egotism; he names specific ministers and dispenses verdicts with military directness. It should be required reading in the Canadian armed forces. A stern indictment of what the author calls a “broken and morally bankrupt” system.